The components used in a windshield wiper system includes a wiper motor, transmission, wiper arms, wiper blades, wiring, switch, module, and washer pump. These items are all available at any auto repair parts shop. The wiper motor is a permanent magnet motor that is capable of multi-speeds. Hi and low wiper speeds are obtained by varying the field current through the motor. This is accomplished by using different resistance paths to ground through the wiper switch. When the windshield wipers are turned off, they are returned to off position by using a park switch. The park switch is designed to deliver voltage to the wipers until they are in their park position. The transmission converts the rotating motion of the wiper motor to the back and forth motion of the wiper blades. The wiper transmission is a complex series of linkage rods and rotating cams. It is normally located under the plenum in front of the windshield. The wiper arms are designed to properly tension the wiper blades against the windshield. 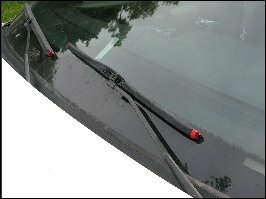 The wiper blades are held against the windshield with enough tension allow windshield clearing without wiper blade chatter. The wiper module allows windshield wipers to operate using a delay mode. The delay mode can command the wipers to operate once every few seconds up to once every 20-30 seconds. The wiper module is a circuit board that contains timers that command wiper operation in response to a signal from a variable resistor in the wiper switch. When the driver sets a wiper switch to a desired delay setting, he or she is actually sending a voltage signal to the wiper module through the variable resistor in the wiper switch. Windshield washers consist of an electric washer pump mounted in the washer bottle or on the wiper motor, or a mechanical pump operated by the wiper motor. A majority of vehicles use an electric washer pump. When washer operation is commanded by the driver, a pump picks up washer solvent from the washer tank and delivers it via the washer tubing to the washer nozzles. The nozzles are designed to deliver a high pressure spray to the windshield. Most makes of vehicles will deliver a 2 to 3 second spray followed by wiper operation for 5 to 6 seconds. 5 Comments on "Windshield Wipers"
on a 1996 MERCURY VILLAGER WHERE IS THE WINDSHIELD WIPER MODUE LOCATED? I HAVE REPLACED THE SWITCH BUT WHEN THE VEHICLE IS TURNED ON THE WIPERS CONTINUE TO OPERATE UNTIL THE VEHICLE IS TURNED OFF UNLESS MY DIAGNOSIS IS WRONG THE MODULE NEEDS REPLACED. Hi i want to know can we repair electric system of car with labtab and a cable that connect labtob to eobd? Hi! Thank you for this article. How can we maintain a good windshield wiper system?